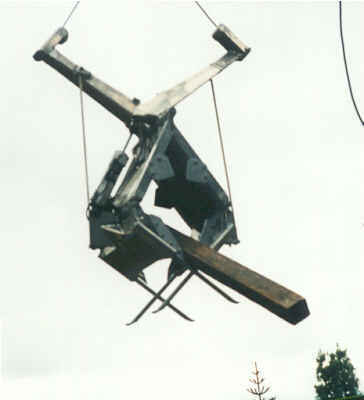 The Fandrich Aerial Grapple moves materials by using only the lift of the helicopter to grasp, carry and dump the load. All action is mechanical. The grapple resets itself by using its own weight. The patented grapple quickly transports material, moves logs or cleans creeks at 80 - 120 loads per hour. The Fandrich grapple's articulated fingers are self-actuating. As the pilot lowers the grapple, four slender, high-tensile steel fingers penetrate deeply into the pile of debris. When the grapple is raised, fingers automatically slide along the ground to get far under the load before the load is lifted. This action is so unique and effective that it is protected by patents. As the helicopter moves up, the load on the helicopter gradually increases over a vertical helicopter travel of about 2 feet. This initial movement allows the helicopter to be in an upward motion before being fully loaded, thereby increasing the effective helicopter lift. A dump switch is the only external control required by the grapple. Triggering the switch releases a unique hydraulic latch. The activated latch permits the arms and fingers to open at a controlled rate and to dump the load. When the arms are fully open and all four grapple fingers point straight down, the Fandrich grapple is reset, ready to repeat its grasping, carrying and dumping operation. 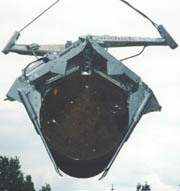 The Fandrich grapple operates without external power. There are no engines to stall, no hydraulic hoses to leak, no electric power to overload. Hooking to the cargo hook and connecting to a switch make the grapple fully operational. large volume capacity- 40" wide by 35" high. aluminum grapple weight- 130 lbs. Fandrich aerial grapples are designed to grab and rapidly transport material using helicopters. 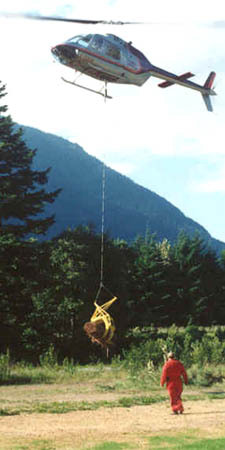 The Fandrich grapple transports materials, moves logs, opens beaver dams and collects debris by using only the lift of the helicopter to grasp, carry and dump the load. All action is mechanical. The grapple resets itself by using its own weight. The grapple hangs on the cargo hook of the helicopter and can be released at any time in an emergency. It weighs about 140 lbs and should not be used with helicopters having a net lift in excess of 1600 pounds. The pilot controls grabbing by lowering and raising the grapple, and dumping through a switch on his control stick. Fandrich grapples are protected by three United States and Canadian patents. The patented grapple quickly grasps, carries and dumps material at 80 to 120 loads per hour. Release the 3 inch yellow locking latch near one end of the grapple by lifting one end off the anchor bolt on the cable arm and rotating it 180 degrees. The cable arms are now free to be lifted up. Unroll the cable with its attached control wire and trailer plug. Connect the free end of the pigtail on the trailer plug to the helicopter wiring. The trailer plug has the same connections as on Fandrich aerial cone harvesters. On the Fandrich grapple, only the green and black wires are used. Connect the helicopter 24 volt supply with a momentary switch between the green and black wires. When the switch in the helicopter is on, the solenoid in the hydraulic latch on the Fandrich grapple is open to allow the latch to contract and the fingers to open. As long as the switch is on, the cable arms are free to rotate and fingers are free to open at a controlled rate. When the switch is off, the latch is locked in place. Lift the cable arms to which the cables are connected. The fingers should slide along the ground as they rotate. Check the operation of the circuit by connecting trailer plugs and turning the switch in the helicopter on. Lift the cable arms. The cable arms should now slowly move up without the fingers rotating or sliding along the ground. When the switch is turned off, moving the cable arms should again rotate the fingers and cause them to slide along the ground. Lift the grapple with the helicopter. 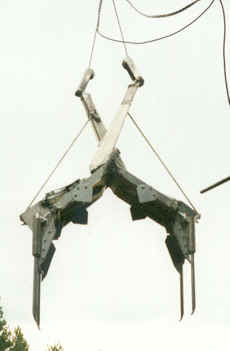 As the helicopter slowly lifts the grapple, the cable arms will move up before the grapple body does. The fingers will rotate and slide along the ground. 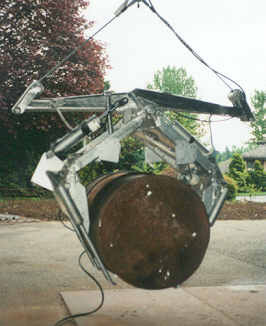 Once the grapple fingers are completely closed or engage the load, the grapple will lift off the ground. The grapple is now in a load-carrying state. With the helicopter holding the grapple free of the ground, turn the switch on and hold it open. The fingers should now slowly open as the hydraulic latch contracts and the cable arms move up. If the grapple is carrying a load, the load would now dump. It may take about 10 seconds for the fingers to open completely. Once the fingers are completely open and pointing straight down, release the switch. The grapple is now ready to be lowered over the load. Lower the grapple and set it over the load to be picked up. After the grapple is sitting on the ground or over the load, continue lowering the grapple cable. The cable arms will continue to drop as the springs pull it down. Once the cables become slack indicating that the cable arms are all the way down, the grapple is ready to be lifted up to grab the load. Repeat procedure steps (1) to (4) above. The grapples are shipped with a yellow locking latch in the locked position. This latch holds the grapple fingers and arms rigidly for transport. This latch should be rotated into the locked position before the grapple is moved by hand and must be rotated into locked position before it is shipped.